For the fourth consecutive year, we present the Tax Transparency Benchmark. 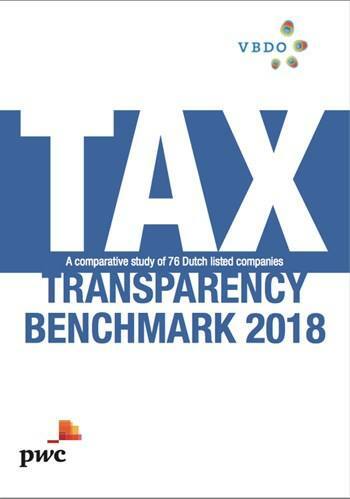 In this report, we present the results of the 2018 edition, in which 76 Dutch companies are ranked on the level of transparency they provide on tax. The aim of the benchmark is to enhance the existing understanding of corporate tax responsibility and to inspire how to communicate comprehensive- ly on tax matters in publicly available documentation. Aegon, AMG and Unilever are the top scoring companies in the Tax Transparency Benchmark 2018. After consultation with an expert-jury, Aegon was announced the winner of the Tax Transparency Award 2018. This company is the top-scoring company in the benchmark and scored above average on all good tax governance principles as published by VBDO and Oikos in 2014. One of the complimented items was that Aegon partially published country-by-coun- try information, such as information on FTE’s and earnings before income tax. Further, Aegon provides a detailed description of how the implementation and execution of the tax strategy is monitored. The average transparency rating of the companies in scope increased from 36% in 2017 to 39% in 2018. This is a positive trend but also shows that there is still quite some ground to cover as the average score is still below 50% of the total points. Furthermore, we are content to report that 68% of the companies provided feedback on their own results. The companies that provided feedback are mostly companies that scored higher on the benchmark. As mentioned in last year’s Tax Transparency Benchmark, the developments surrounding transparent reporting are moving fast. In this context, it was mentioned that VBDO would conduct a thorough overhaul of the Tax Transparency Benchmark methodology for the 2018 benchmark, including the feedback received from many of the participating companies. This resulted in asigni cant change in the methodology compared to last year, which also implies that a propercomparison with the average transparency rating of the companies in scope with last year’sbenchmark cannot be made. Below, we outlined the most signi cant conclusions and recommen- dations for each principle of good tax governance, as published by VBDO and Oikos in 2014. In addition, the table below provides an overview of the percentage of companies that scored per principle of good tax governance.